I have consciously been thinking about how my impact on the Earth can be reduced – in my own small way. My dreams are of collecting rain water, going solar heating for hot water, recycling our grey water…. these are all big projects I can do. I have started by growing organic, having chickens for manure and free-range eggs, making my own compost by saving all kitchen waste for the compost heap. This has become second nature to me now, even though it does take a bit of extra work. But my daughter inspired me to do more. I still throw all my garbage into the bin – I have not worked out a recycling scheme for the plastics and glass and paper and tin cans. Well, today is my day! 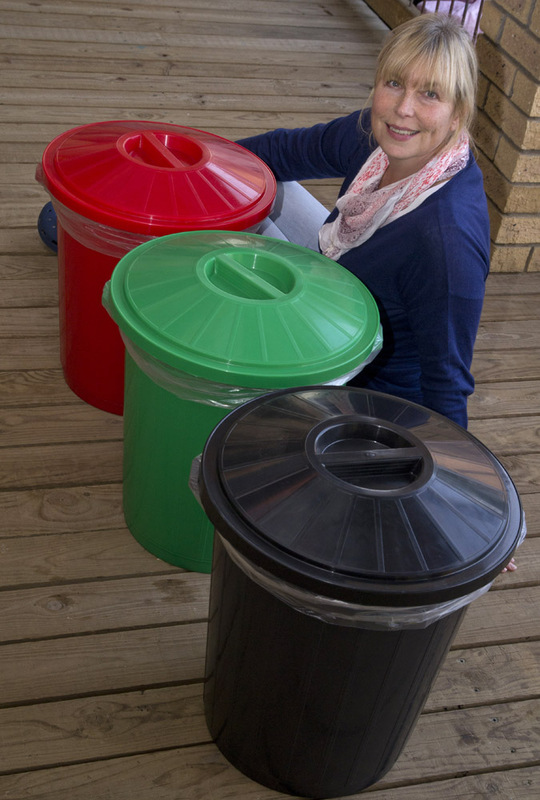 I bought myself coloured bins and will be separating all my trash into the appropriate bin. Ok – what colour bin is for plastic or paper??? Hmmmm…I have Googled the recycling colour code and became so very confused. I thought that there would be a standard SET COLOUR CODE! The colours seem to stay the same – GREEN – BLUE – YELLOW – RED – GREY, but they differ in terms of what goes where!! So I have worked mine out MY way! Paper – GREEN, Glass – RED, Plastic – YELLOW (still need a yellow bin) – Metal – BLACK. I still need to find a local recycling depot. Maybe I’ll start a Recycling Drive here in Philly…….. any suggestions?? we tried this a long time ago and when it came to getting rid of the stuff, noone wanted it. admittedly, it was many, many years ago. i might start doing it again. We have BOXES full of A4 paper awaiting “recycling”! We do reuse some of it, but we seem to accumulate a lot more than we use. That office grade paper should be recycled separately, if you can. We take ours to Killarney Gardens depot -if you ever have reason to go that way? We sort our garbage and take it to Cape Town recycling depot every few months. So sad that in this generation we do not have a recyling process in place. There is a big drive in Durbanville near Kenridge School, so I will be taking my recycling to them. I know that there are individuals that do this in various suburbs, so there is something happening. I will do a recycling test here in Philly to see how many will partake. I’ll keep you posted! That is what made us so cross – there WERE people who willingly and enthusiastically brought stuff to the recycling depot. But we couldn’t get it any further. I think the general attitude of the majority is still “its not my problem and it doesn’t affect ME” – hence the municipalities don’t care. To think we (as a country) can organise an event of the magnitude of the 2010 WC, but we can’t get our garbage organised … very sad state of affairs. I agree! Very short sighted. I drive past the Frankiedale dump on my way home from town and it just upsets me to see the queue of trucks dumping into the landfill tons and tons of stuff! We need to recycle, I don’t think it is a matter of an option anymore! Barbara – today was refuse collection day in our neighbourhood. All my enormous black bin contained was a single small “Checkers” bag. The recycling company collect a l-a-r-g-e (jumbo) sized bag of recycling later today contianing: paper, plastic, tins, cardboard, styrofoam – all gone to be recycled! Add to that Woolies who have a box for CFL’s, and our local stationers who accept batteries and empty print cartridges. Hi Dani – I know it feels real good to be doing something worthwhile like this. I empty my bin every morning and I literally have NOTHING to put into the black dustbin, so 99% can be put to a recycling bin.